I was blown away by how lovely the hotel is! 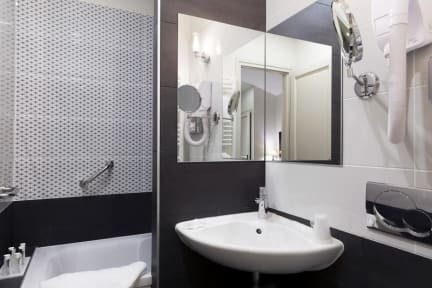 I booked it on hostelworld last minute and did not realise it was a lovely boutique hotel in a perfect Parisian location with working air conditioner and great breakfast. Everything greatly exceeded my expectations. 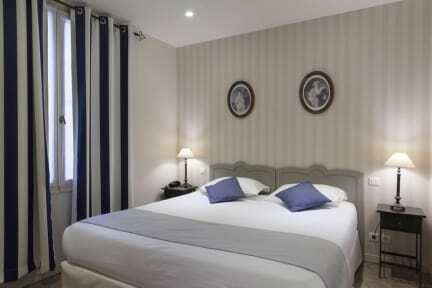 My husband, and two children ages 8 & 9 had a lovely stay at The Mogador Hotel. We loved our room. It was very quiet, clean, comfortable and the staff very friendly and helpful. It was in a great location for us. We came in on the Eurostar from London. It was close to a metor stop as well. If we come back we will try and stay at the Mogador again. Loved it. This is the best hotel stay we have had. Lovely hotel in a great location in Paris. Very clean. Beautiful breakfast spread. Cute rooftop. Everything you could need. This was a beautiful hotel and a perfect romantic getaway. It was very secure and relatively close to anything you want to do in Paris. The only thing to consider is that breakfast is in fact not included, but on hostelworld it was stated that it was! But the staff was great and so was the room. We will be staying there the next time we go to Paris.